The family of a woman who died from asbestos-related cancer after a huge fire at a military base in Shropshire has received a substantial payout. Susan Maughan inhaled the toxic dust in 1983 after the blaze at army base COD Donnington which scattered ash, containing asbestos, for miles around. She, like others, cleaned it up after the council did not start its clean-up for three days, family solicitors said. Mother-of four Ms Maughan died from mesothelioma in 2015, aged 63. The Ministry of Defence said (MoD) said: "Our thoughts remain with the family and friends of Susan Maughan. "When compensation claims are received they are considered on the basis of whether or not the MOD has a legal liability to pay. Where there is proven legal liability, compensation is paid." 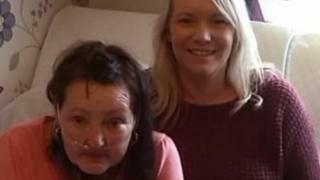 Daughter Lorraine, 47, who was 11 at the time of the fire, said: "Sadly I don't think mum will be the last victim. "My sisters and I now also worry for our health as we played with the dust and debris, which looked like snow, as did many other children." Madelene Holdsworth, from Slater and Gordon who represented the family, said: "The ash was spread across a 15-square mile area, much of it residential, so it is likely that hundreds, if not thousands, of people were exposed to asbestos that day." In 2008, BBC Inside Out reported that defence chiefs were warned the base was not safe prior to the fire. Documents showed safety measures were ruled out in 1977 - six years before the fire - on "operational grounds" and cost, the programme said.